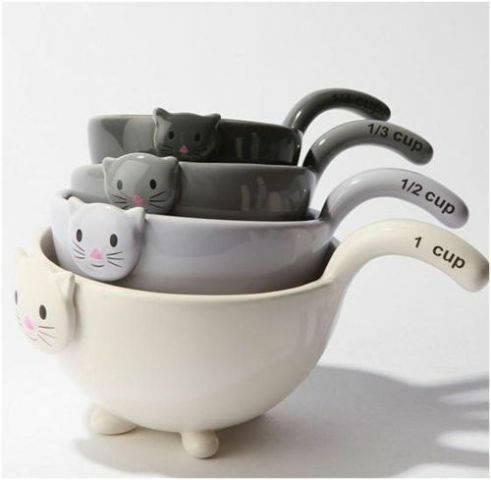 Food prep will be more fun with these cool Cat Measuring Cups. You've never done such cute and cuddly cooking. If it's not quite your style, then it's just the purrrfect gift for your favorite kitchen god or goddess. Or just the greatest bridal shower gift ever for that special cat lover. The set of four ceramic cups/bowls measure 1 cup, 1/2 cup. 1/3 cup, and 1/4 cup. Comes in four colors -- cream, light gray, dark gray, and black. They nest together for easy storage. For more information or to order, click here.